Would you like to subscribe to the UFC Newsletter? Prior to Friday’s ceremonial weigh-ins in New York City, the four combatants set to headline this year’s final Pay-Per-View took to the stage at Madison Square Garden to set the table for their twin title clashes at UFC 232. Seated on one side of the dais were women’s bantamweight champion Amanda Nunes and Alexander Gustafsson, with featherweight titleholder Cris Cyborg and the returning Jon Jones taking up residency on the other side of the stage. Separated by UFC President Dana White, the heated rivals who are set to resolve their differences inside the Octagon on Saturday, December 29 at T-Mobile Arena in Las Vegas, Nevada exchanged verbal jabs in the build-up to what should be an explosive night of fights to end the year. For Jones and Gustafsson, who will battle to determine the new UFC light heavyweight champion, this is a rematch numerous years in the making. The duo first met at UFC 165 in Toronto, Ontario, Canada, with “The Mauler” pushing Jones unlike anyone had pushed him to that point in his career and perhaps since. "I beat you once. I can beat you again." “The last time I fought Alexander Gustafsson, a lot of people in the media were saying, ‘He’s a lot like Jon Jones — he’s tall, he’s lanky, he can move’ and in my head, I was hot, I was on a roll and I just figured, ‘Maybe he fights a lot like me, but he’s not me,’” said Jones, recounting his thoughts in advance of his first meeting with the Swedish standout. “I didn’t train as hard as I should have. I was winning so many fights, I was being a wild dude and I was still winning and it caught up to me,” he continued before being interrupted by Gustafsson. 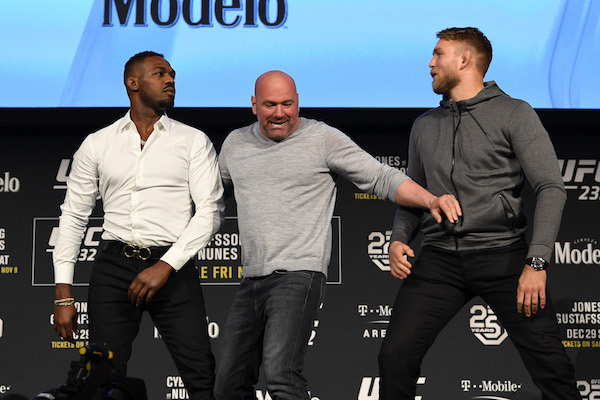 That difference of opinion on the outcome of their first encounter remained a sticking point throughout Friday’s festivities, as Gustafsson repeatedly suggested that he defeated Jones in their previous meeting, prompting the returning former champion to get his upcoming opponent’s thoughts on some of his other results for clarification. "What's your excuse for losing?" “Did you beat DC as well?” Jones asked Gustafsson, referencing his split decision loss to the current “Double Champ” at UFC 192. “We had a close fight. Did you get ripped off in the DC fight as well? You beat me, but you lost to DC? While Jones and Gustafsson have already gone five rounds together inside the Octagon, Cyborg and Nunes have been battling for months on social media as they’ve each shared their thoughts on this historic meeting between female UFC champions. Cyborg, who retained her featherweight title with a first-round stoppage win over Yana Kunitskaya in March, took umbrage with Nunes angling for the opportunity to face her, but not being ready to compete in September, when Cyborg had wanted to return. The former Strikeforce and Invicta FC titleholder has also repeatedly taken aim at Nunes for having pulled out of her scheduled bout with Valentina Shevchenko at UFC 213 on the day of the fight and did so again on Friday. “I accepted to fight her when I fought Holly Holm,” said Cyborg, who earned a unanimous decision win over the former bantamweight champion last December at UFC 219. “She asked for nine months to train for this fight. I think when you call somebody out, you have to be ready; you shouldn’t need nine months to get ready. Every time Cyborg has chided her, both Friday afternoon in New York and the myriad times prior on social media, the undisputed bantamweight champion has stuck to her guns, explaining her reason for wanting to fight in December and how important this opportunity is to her. “I gave my timing to the UFC,” countered Nunes, who has always maintained she would be ready to fight on this card. “I have to be ready for her. She’s strong and she’s powerful and I have to be ready. I gave my timing, my date and now we are here, ready to go. Although there are tremendous fights on tap this weekend at Madison Square Garden and a slew of outstanding events on the calendar before these bitter rivals finally collide in the Octagon at the end of the year, Friday’s press conference lit the fuse on these explosive contests and now it’s just a matter of time before the fireworks go off at UFC 232 in Las Vegas. T-minus 57 days and counting until these two championship blockbusters blow the roof off T-Mobile Arena. Take a sneak peek behind the scenes of UFC 235: Jones vs Smith. Derrick Lewis earned a Performance of the Night bonus with a knockout victory over Marcin Tybura at Fight Night Austin last year. Lewis faces former heavyweight champion Junior Dos Santos in the main event of Fight Night Wichita on March 9. Take a slow-motion trip through some of the highlights from UFC 235 this past weekend featuring Jon Jones, Kamaru Usman and more. Écoutez ce que le nouveau champion des poids mi-moyens, Kamaru Usman, avait à dire à la suite de sa victoire sur Tyron Woodley at à l'UFC 235. Woodley s'est aussi adressé à la foule au T-Mobile Arena. Les débuts d'Israel Adesanya dans l'Octogone étaient les plus attendus depuis ceux du double-champion Conor McGregor. "The Last Stylebender" a impressionné avec une victoire par TKO au second round vs Rob Wilkinson et a commenté sa performance. De retour dans les coulisses, Yoel Romero, discute de sa victoire avec la correspondante de l'UFC, Megan Olivi, à Perth en Australie. De retour dans les coulisses, le poids lourd, Tai Tuivasa, discute de sa victoire par KO avec la correspondante de l'UFC, Megan Olivi, à Perth en Australie. De retour dans les coulisses, le poids lourd, Curtis Blaydes, discute de sa victoire avec la correspondante de l'UFC, Megan Olivi, à Perth en Australie.